A team of University of Minnesota Extension health and nutrition and SNAP-Ed educators (the “food shelf team”) launched the Nudging to Health workshop in August 2016. The class is one of three developed to assist food shelf staff and volunteers in achieving better outcomes for their clients. To date, there have been 22 Nudging to Health workshops conducted throughout Minnesota, with 233 staff and volunteers trained. They represented food shelves from Hibbing in northeastern Minnesota to St. James in the south central part of the state. Classes are taught by SNAP-Ed educators with the Extension Center for Family Development. So, what does the evaluation data show? Participants rated both the quality of instruction and the class content highly. More than 98 percent of participants agreed with survey statements saying instructors were well-prepared and answered questions clearly, and more than 97 percent agreed that instructors held their attention and presented information that would help them. In feedback about the content of training, more than 97 percent agreed with statements saying the things they learned were useful and that they felt confident about nudging clients at their food shelf as a result. More than 98 percent agreed with a statement saying they were “eager” to nudge clients to healthy eating after taking the training. 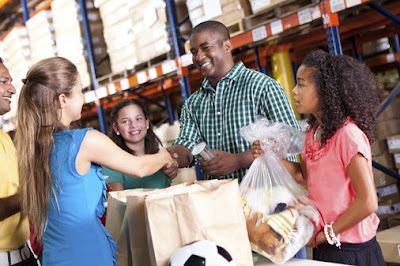 Finally, more than 97 percent agreed that they would recommend this training to other food shelf staff and volunteers. Nudging to Health workshops continue this year. Agencies may partner with a SNAP-Ed educator to offer the workshop to local food shelf staff and volunteers or download online resources to conduct their own training. The food shelf team also continues to work with FD’s Communications and Educational Resource Development Team to develop other training and promotional materials for food shelf staff and volunteers. One example is ready-to-use text messages offering tips for healthy eating that food shelves can send to clients.